One of the Mitchell plans of New York to show the Brooklyn Bridge. Mitchell Jr., S. A., Mitchell's New General Atlas, containing Maps of the Various Countries of the World Plans of Cities, Etc. Embraced in Ninety-Three Quarto Maps. Forming a series of One Hundred and Forty-Seven Maps and Plans. Together with Valuable Statistical Tables. (Philadelphia) 1882. Very good condition. Minor verso reinforcement on original centerfold. Blank on verso. centerfold. Even overall toing. Rumsey 0586.016. 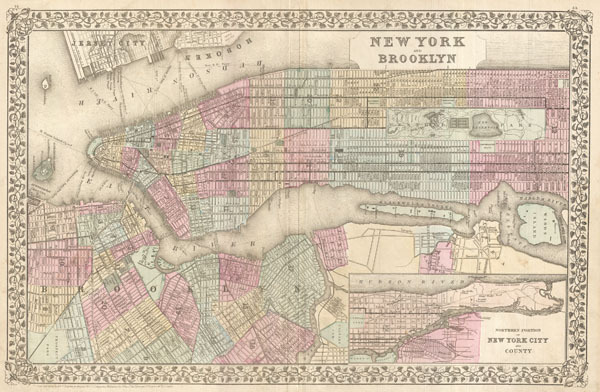 Haskel, D. C., Manhattan Maps, A Co-operative List, 1230.